Exactly 500 years since the death of Amerigo Vespucci, Florence marks the event with an exhibition designed to celebrate the strong ties linking the Old World and the New. 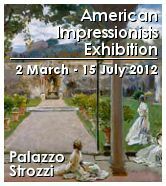 The exhibition explores the American impressionists' relationship with Italy, and with Florence in particular, in the decades spanning the close of the 19th and dawn of the 20th centuries. The exhibition contains works by painters who, while not explicitly subscribing to the new style, were nevertheless crucial masters for the younger generations: men such as Winslow Homer, William Morris Hunt, John La Farge and Thomas Eakins. These will be followed by the great forerunners, artists such as John Singer Sargent, Mary Cassatt and James Abbott McNeill Whistler, who could boast of strong cosmopolitan leanings.